Way back in July 2004 there was a BBC article about a proposed new building on the rapidly changing Ipswich waterfront. This project would include a flotilla of flats, a dance studio and have as many storeys as David Beckham's shirt number. Finished development finally opened last year and has an uncanny resemblance to the artist's impression. Move aside, Cumberland Towers, there's a new landmark in town -- The Mill -- and you cannae miss it. 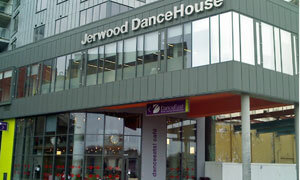 Facing the murky waters at the base of the tower is the Jerwood DanceHouse, the groovy new home of DanceEast. De rigueur these days to run those words together withoutaspace. Like any arty space worth its Saxa, Jedward House has a cafe, sweety. Does the name DanceEats work for you? Consider my boat floated. For an unsettling couple of minutes, it seems as if I'm the first to arrive. Then I overhear the waitress mention "two gentlemen on a sofa upstairs". Dur, hadn't realised there were two levels of seating. Arranged on soft furnishings overlooking the lobby & shop are Andy, the green man, and Rene, the sultan of ceroc. G's missed his bus. Back downstairs to order from the chalkboard. Jackets and salads a-plenty, plus a neat design your own sandwich / baguette / panini / ciabattini by choosing ingredients from columns A, B and C. In my case, chorizo, applewood cheddar and rocket. There's the odd toddler toddling about, Times or EADT to flick through, free WiFi (thumbs aloft), some lean-looking light-lunching dancers, and here's my posh panini with a handful of balsamically dressed leaves. Drinking a Bertram's blueberry smoothie; should have had a Tango. Re-descend to admire the cakes on display -- I'll have that square wodge of coffee cake, please, and an Americano. Will add their loyalty card to my wallet alongside those for Coffeelink, Caffe Nero, Costa and, er, McDonald's. Quality coffee here on the quayside. I rather like it. As Bowie said, Let's Dance. If it was a car -- Tesla Roadster. If they were passing by -- Michael Clark.